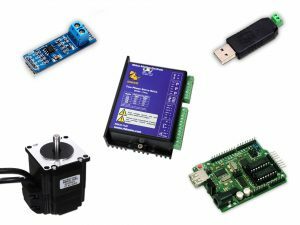 The RMCS1120 Hybrid Servo Drive is operated as Modbus RTU Slave through Arduino Robot Control Board as Modbus RTU Master. The Arduino Master Control Board made by Robokits India is capable to control RMCS1120 Drives Running as its Slaves through Modbus RTU Communication. In this project, the Arduino controls three RMCS1120 Drives with slave addresses 01, 03 and 05. Note: Make the Pins RE and DE as a single point by shorting them. The general rule of thumb to get the most out of the motor is to drive it with a supply voltage that is at-least 3 to 4 times its rated supply voltage. A DC regulated power supply with good low-ESR decoupling capacitors on its output is recommended for best performance of this drive. There is a single LED on this drive for power and error status messages. In case the LED is blinking or flickering please check all connections and powered-down, wait for 5 seconds and then power-up the drive once again. When the entire system is stable, the LED at Pin A3 of Arduino Master Control Board blinks at constant frequency, All the three LEDs at Pins 2, 4 and 6 of Arduino Master Control Board are OFF and the Power Indicator LED of Arduino Master Control Board is latched to ON state. The Green LED of RMCS1120 Drive is latched to ON state. The motors run as per their parameter settings. If the Power indicator LED on the Arduino Master Control Board flickers, it indicates issue with power supply. The blinking On-Board LED (connected at Digital Output Pin A3) of Arduino Master Control Board indicates healthy firmware condition. If it’s not blinking and sets to a particular state (ON or OFF), then it indicates the system is unhealthy. Check the connections. The LEDs located at Pins 2,4 and 6 on Arduino Master Control Board are indicators for healthy communication with slaves 1, 3 and 5 respectively (If they are OFF, the communication is healthy). If any of these LEDs is ON, it indicates communication failure of Aduino Master with that corresponding slave. Pin 2 is for Slave 1 with Modbus RTU Slave Address 01, Pin 4 is for Slave 2 with Modbus RTU Slave Address 03 and Pin 6 is for Slave 3 with Modbus RTU Slave Address 05. The firmware (Click Here to Get) for this project has been designed in such a way that Arduino works as a Master Controlling up to Three RMCS1120 Slaves. The number of slaves can be increased by updating firmware if required. The firmware is designed to communicate with slaves having addresses 01, 03 and 05. It is mandatory to assign the proper slave addresses to the drives before connecting them to Arduino Master Control Board. The slave addresses can be set in RMCS1120 by using any Modbus Master Poll Software in PC and a USB to RS-485 Converter (Click Here to Get). Click Here to know this procedure using the qModMaster Tool. The heart of the firmware is the function “motor_control” that has four parameters named slave address, velocity command, acceleration command and motion command. Refer the RMCS1120 Manual Here to get to know more about the drive parameters. is called whenever a register at address 8196 is to be preset to value 0 to start the motor. The periodic function “readModbusRegister” is used for reading the status of single register having value of Motion Status at address 0x2004 of all the three slave drives. If it finds the Motion Status IDLE (Value 0x0004), then it calles the “motor_control” function to set the motor parameters and then presets register at the same address (0x2004) with value 0x0000 to start the motor.